Gazing out our vehicle’s window, palm trees wave in the breeze as we cruise down a narrow rural road. While watching the world pass by, I see an odd looking lake in the hills to the east. 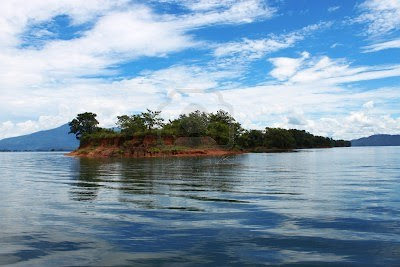 Out in the brown waters of a lake, are small hilltop islands close to shore; longtail boats cruise their way between them. On one small island, I spot cattle that have been stranded. They have a confused look about them, as they wait to be rescued. That’s when I realize that that this isn’t a natural lake. These waters come and go, and these islands are only temporary. What the cattle are standing on, is really just a hill that became an island after recent rains. This isn’t a natural lake at all, it’s a vast reservoir for the Nam Ngum Dam, north of Vientiane. Built with foreign aid, Nam Ngum was built during the war, opened in 1971 to provide hydroelectric power. After the communists took over, the dam’s reservoir took on an additional function: as a prison. The islands held not loose cattle, but Laotians associated with the old regime. Out on larger islands of the reservoir, two prison camps were built. One island prison was for men, another for women. When the Pathet Lao took over in 1975, they rounded up an estimated 20,000 – 40,000 Laotians. These included soldiers, policemen, teachers, Royal Laotian Government officials, and office workers who had worked for westerners. Just as had been done in Vietnam, the prisoners were sent to remote prison camps for ‘re-education’. Added to these 'enemies of the state', were other undesirables that didn’t fit in with the new ‘communist paradise’. Also sent to the bamboo gulags, were prostitutes and opium addicts from Vientiane. Fortunately, with the liberalization of government policies, that dark chapter has for the most part passed. The prisons on the reservoir were closed years ago. Hydroelectric dams in Laos are controversial, since there is an ongoing boom of dam construction. There are currently seven dam projects under construction in Laos, and even more are being proposed for the countries many rivers. One of the larger dams, called the ‘Nam Theun 2’, is currently being built in central Laos, on the Nakai plateau. Although the project is backed by the World Bank, it’s been running behind schedule. Since the Nam Theun River is a tributary to the Mekong, the project has received a great deal of criticism from environmentalists, and sociologists concerned about affected communities. 6,000 villagers from the area have already been relocated to make room for the reservoir, and nobody knows what the long term effects of the dam will be on the environment. Initially I thought that hydroelectric dams would be good for Laos, but an Australian scientist I spoke with in Vientiane convinced me otherwise. Hydropower, as well as increased logging and mining, have been a mixed blessing for Laos. The rise in business has brought in much needed foreign capital, and more villages are receiving electrical power. But the Laotian people are still not the main beneficiaries. With the return to Laos of large scale infrastructure projects as well as mining and logging, the resulting rise in corruption was predictable. Local government officials who had been earning less than $100 a month, soon found fat contracts crossing their desks that were worth millions of dollars. The Vientiane Times gave one example of the problem. This rare story condemning corruption by government controlled media, is startlingly frank. Laotian power lines. Most hydroelectric power here is sold to neighboring Thailand. Prosecutors are still unable to bring to trial government officials who break the law and abuse their position of power because of lack of cooperation from the sectors concerned. The Lao People’s Supreme Prosecutors’ Office has identified a number of criminal cases among government officials, ranging from corruption to helping people illegally sell timber and provide land concessions. But prosecutors are unable to pursue these cases and submit the results of their inquiries to the court for subsequent trial and judgement because other government agencies do not provide the necessary cooperation, according to a report from the office. At present, the only stop most state agencies take against offending officials is to ask them to make a commitment not to repeat their wrongdoing. Those who commit a serious crime are removed from office without the case going to court. With the lack of accountability, the Laotian judicial system is failing to reduce corruption. It’s no wonder that Transparency International’s 2012 Corruption Perception Index ranked Laos as 160th out of 174 countries in the world. That makes Laos more corrupt than Vietnam. Since Laos lacks high tech professionals, it continues to be foreigners supervising the work on these big projects. I recall a dinner in Vientiane, where I met Tatiana, a twenty-something Moscovite who had been here for a year. “I work for construction company, (they) build dam,” she said from behind her glasses. She told me that even though the dam wasn’t yet finished, the power had already been sold to Thailand. Although Tatiana enjoyed her work, she didn’t like Laos. In less than a week, she would go back to Russia for vacation. She missed home, and missed Russian cuisine. But it wasn’t just the food that made Tatiana dislike Laos. She'd been sick lately, home in bed for a week with a bad fever. “I had ra tifis,” she said. “Excuse me?” I said. “Sorry, I don’t understand.” She repeated herself a few times, and I finally got her meaning. That poor young lady. She came all the way here to work in a foreign country, and ended up with a disease transmitted by vermin. I’m enjoying my time in Laos, but I wouldn't be surprised, if Tatiana never came back from her vacation.